From time to time, the lunchroom runs fundraising specials for Division 1 field trips, Grizzly Cubs, and other groups. These specials are usually $5.00 and include a drink and a treat. Watch the announcements and the calendar for specials information. Starting November 5, the Breakfast Program will provide nutritious food daily to Swan Hills School’s students in grades K-12. Funding for the elementary is provided through the Alberta government’s School Nutrition Program. Junior and Senior High students’ breakfasts are funded by donations from Secure Energy. The food will be prepared each morning by volunteers from our staff and community and offered to all students who choose to participate. There is no cost to parents. The menu will vary, but will typically consist of cheese, hard-boiled eggs, bagels with cream cheese or plain, yogurt tubes, applesauce, fruit and veggies. Students will choose one of each item. 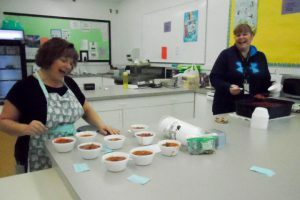 Swan Hills School chooses to participate in this program because research shows that there is a direct link between healthy and nutritious eating and academic success.